When we’re rushing to protect lives and property, voting rights may not be uppermost in our minds. Nonetheless, when homes flood from rising waters or blown off roofs, voting rights can be compromised. That’s because many states, including South Carolina, require personal identification such as a driver’s license or passport to vote. All these forms of identification can be lost when homes are destroyed. And the underlying documents we use to obtain photo or other identification papers can be lost or destroyed too, like birth, marriage and divorce certificates, making it very difficult to replace identification cards. This is particularly true for people who live in poor or minority communities, which are often the first to flood, according to citylab.com. The Brookings Institution has observed that poverty “exacerbates a disaster’s impact” and that governmental response to natural disasters is inherently political. Many believe that the difference in response last year to mainland USA communities and Puerto Rican communities ruined by Hurricanes Maria and Irma reflects this reality. Locally, people in poor and rural communities often have transportation issues as well, making it difficult to get to the Horry County Election Commission, which has only one office in Conway. South Carolina requires a photo ID in order to vote, compounding the problem. There are fewer than five weeks before the November 6 midterm elections and only two weeks to complete voter registration. Despite a request from Horry County Democratic Party (HCDP) to extend registration due to the severe flooding and difficulty in driving to Conway, Sandy Martin, director of Horry County Board of Voter Registration and Elections (commonly known as the Horry County Election Commission), said she does not believe that state authorities will allow a registration extension, although she had not yet received an official answer. 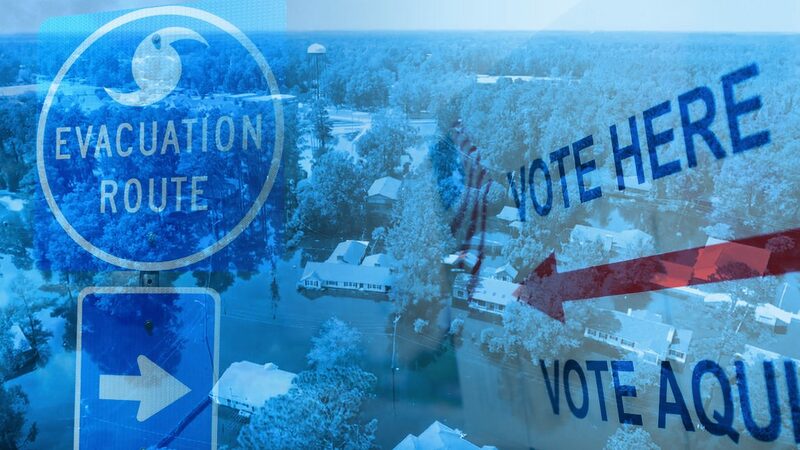 HCDP also requested extensions of in-person absentee voting as well as additional locations in which to vote in-person absentee, as it is difficult and time-consuming to drive into Conway during the flooding and many will experience significant flooding and/or loss of their homes due to historic flooding. HCDP encourages everyone to check their voting credentials including voter registration card and photo ID. If these were lost in the recent hurricane or its aftermath, make sure you replace them as soon as possible. If you are registered to vote but lost your driver’s license or other photo ID in the flood, you can vote under the reasonable impediment provision. The voter presents his or her voter registration card and asks to sign an affidavit stating the reason and then may vote a provisional ballot. The provisional ballot will be counted unless someone presents evidence why this voter’s ballot should not be counted. If you lost your blue voter registration card due to the flood or any other reason, you can get it replaced. HCDP recommends doing this as soon as possible. Voter registration information may be found online at scvotes.org, where you can verify that you are still registered to vote and find your precinct and other voting information. If you have not yet registered to vote, you can register here if you have a driver’s license. If you have a printer, you can print out this information and carry it with you. As of this publication date, all precincts are voting in their usual locations, other than Green Sea, which was moved for reasons not related to flooding, according to Martin. Department of Motor Vehicle offices are located in Myrtle Beach, Conway and Little River. If you are not yet registered to vote, you can register when you obtain or replace a driver’s license simply by asking at DMV. The registration deadline for the November 6 election is October 5 in person and October 7 online. You should receive your blue voter registration card before the election. It is best to go to the Horry County Election Commission at 1515 4th Avenue well before voting day and ask for a free permanent photo ID and, if necessary, a new voter registration card. HCDP also recommends registering online over using the DMV procedure due to occasional failures in the “motor voter” process. If you have any problem with voter registration or voter identification, Horry County Democratic Party may be able to help you. Contact us for more information.